Lets be honest. Not everyone wants to migrate their large forums over to vBulletin 5. There are too many uncertainties.Will my SEO ranking stay the same? Are the same plugins available. What about all my custom configurations and themes? Not only that, there is so many plugins in vBulletin 4 that allow me to virtually create anything at the moment, why does it make sense to move to vBulletin 5. And thus, this plugin was born, essentially creating a modern vBulletin 4 platform on top of the existing infrastructure. With a new vBulletin “ForumHome” remastered, the pages render faster, and allow for a more pleasant browsing experience for everyone. No more clicking to navigate to view more content. 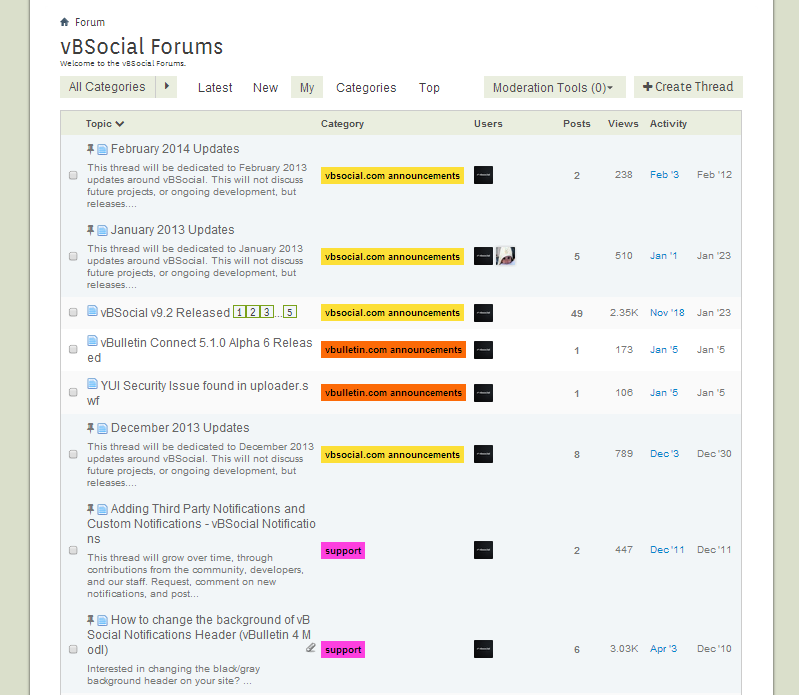 vBSocial Modern Forums loads new content on the fly without having to navigate across boards. Easily drag multiple images onto our new editor so your users can add attachments faster, the modern way. Because the data is now sorted in a tabular format, you can sort all your threads by popularity, rating, views, activity and much more with a simple click. It takes 2 minutes to install this plugin, and 2 minutes to quickly transform to your new modern forum. Not everyone wants to move to vBulletin 5. Content gets buried on your vBulletin 4 site. With the new system, there are many new ways of discovering new and old content. Our plugin has been tested to work with our main plugin vBSocial Social Network. 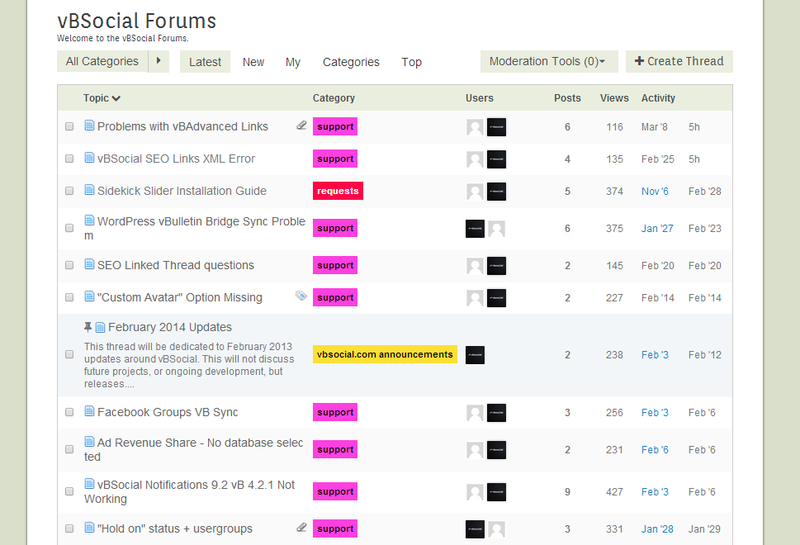 You can now create threads from the forum home page, as well as the category pages. This allows for more content creation, as content is king. 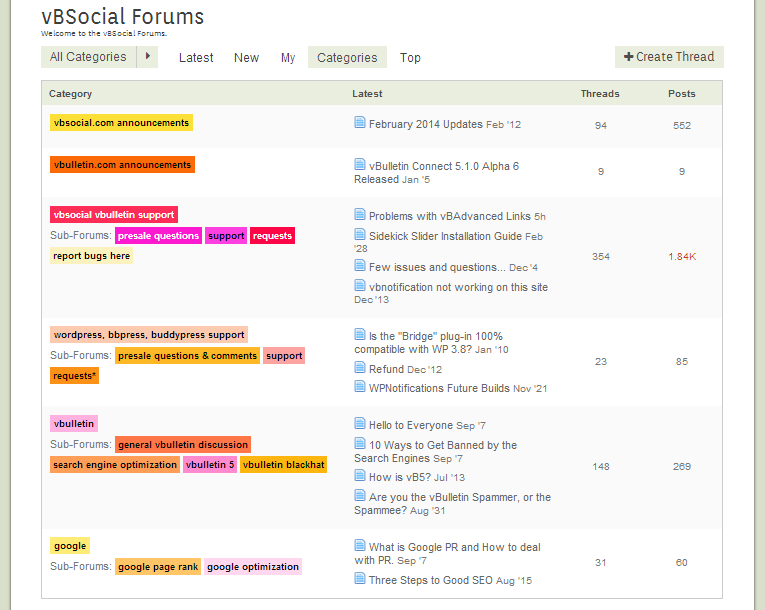 Easily configure your forum categories to look a certain color. By default, we automatically color code them for you based on your themes colors. The future of forums is here. Posts sorted by your activity.